The Power Evacu-Trac is a versatile stair-climbing chair that can be used for emergency evacuation from below ground level to the exit level. 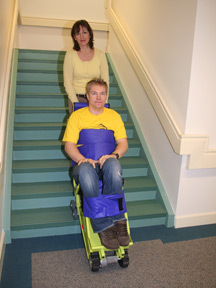 It can also be used to provide a versatile stairway access solution for the elderly or those unable to climb stairs. A powerful motor and battery allow a small attendant to easily move a heavy passenger up and down stairs with the push of a button. Rubber tracks securely grip the stairs.